China scores overwhelming win in Nong Shim Cup: Thanks to seven wins in a row, the best winning streak in this tournament’s history, by their first player, Fan Tingyu, China dominated the first two rounds of the 18th Nong Shim Cup. In the last game of the second round, Korea’s Pak Junghwan finally put a stop to the streak, but both Korea and Japan were down to their last player, while China still had four. 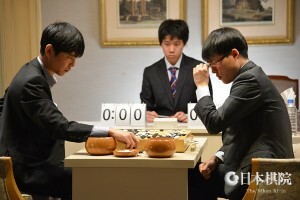 The final round started in Shanghai on February 21. In Game 10, Pak (W) beat Iyama Yuta of Japan by resignation. In Game 11, the second Fan on the Chinese team, Fan Yunruo 5P (W), beat Pak by 1.5 points, so China secured a one-sided victory. Win-loss totals were: China 8-1, Korea 2-5, and Japan 1-5. China has now won the cup four years in a row. Iyama wins Shusai Prize: On January 31, Iyama Yuta was awarded the 54th Shusai Prize, which honors the outstanding player of the previous year. This is the fifth year in a row he has won it. 50th Kido Prizes: The magazine Kido lives on in the form of the annual Kido Prizes, awarded to the outstanding Nihon Ki-in players of the previous year. The winners for 2016 were chosen on February 13 by a panel of representatives of the go-sponsoring media. Winners are: Most outstanding player: Iyama Yuta, for winning all top seven titles; Outstanding player: Takao Shinji, for winning the Meijin title; New face: Onishi Ryuhei, for winning the King of the New Stars; Women’s prize: Xie Yimin, for winning four women’s titles; International prize: not awarded; Most wins: Ichiriki Ryo (47); Best winning percentage: Onishi Ryuhei (39-10, 79.59%); Most successive wins: Adachi Toshimasa 4P (15); Most games played: Ichiriki Ryo (66). Lee Sedol wins exhibition match: Lee Sedol was invited to Japan by the Japanese Shogi Federation to play a ceremonial role at the start of Electric King title match. His job was to “shake the pieces.” As far as I can work out, not being a shogi player, this is the equivalent of the nigiri for deciding black and white in a game. 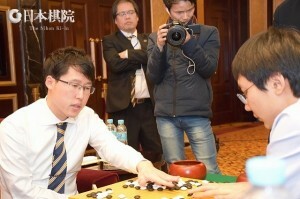 The Nihon Ki-in took advantage of his visit to arrange the Korea-Japan Exhibition Match between Lee and Iyama Yuta. It was played at a Tokyo hotel on February 26. Lee (B) won by resig. after 227 moves. The game started at 5:30 pm and finished at 8:34 pm.